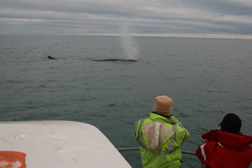 30th Jan 2007 Availing of the continuing weather window, the IWDG headed out again on Mon 29th Jan joining a research project by BIM, and found common dolphins and fin whales a plenty. The aim of the fieldwork was to continue trials on acoustic deterrents known as pingers on common dolphins. They are being developed by Irish Sea Fisheries Board (BIM) to deter dolphins from pelagic trawl nets. BIM have contracted the Galway-Mayo Institute of Technology (GMIT) (Dave McGrath and Joanne O'Brien) and Simon Berrow of the Shannon Dolphin and Wildlife Foundation (and IWDG) to test the reaction of dolphins to these pingers (See IWDG News Issue 30 pg 12 &13). This was one of those rare occasions, when the weather was favourable (calm), the subject (common dolphins) were both numerous and obliging, and the equipment worked well. In between acoustic samples, we searched for those familiar distant blows and photographed at least 4-5 fin whales, which remarkably have stayed in the same area, 3-5 miles South of Capel Island, for the best part of a week. We are very grateful for all those who have reported this activity and encourage anyone who observes similar activity anywhere along the Waterford or Wexford coast to report these sightings to the IWDG via www.iwdg.ie. Luckily, this activity is inshore and can, given suitable conditions, be observed from land without optics. However, as always we advise the use of binoculars or spotting scopes. Suggested locations are Ballycotton Head or Knockadoon Head, East Cork, and Ram Head, Ardmore, Co. Waterford. Reports of further sightings off Brownstown Head, Dunmore East and Hook Head suggest that the activity off Youghal area may just be the tip of the iceberg. 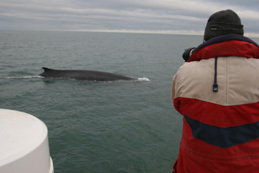 This is a wonderful opportunity for wildlife watchers to observe the 2nd largest animals on the planet. Enjoy!! Thanks to Ronan Cosgrove of BIM for providing IWDG with this opportunity to join the field-trials and obtain more images of fin whales.